Custom picture frame overall size 9x11 wall hanging photo frame hold 4x6 PORTRAIT photo. 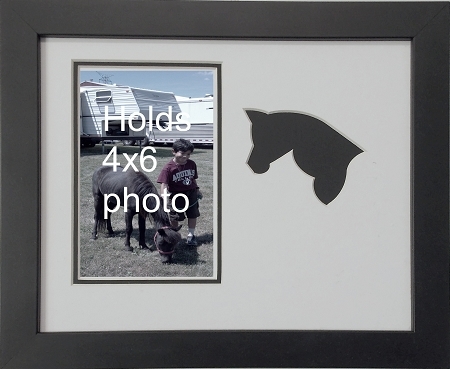 Custom picture frame has a double mat with unique horse silhouette carved in top mat. Black bottom mat with white top mat has a black flat face wood frame which is easily accessible from the back to add photo. Unit includes glass, wall hanging system and photo mount board and photo tape.